The American pit bull terrier, or Staffordshire terrier, is a medium-sized dog known for it loyalty and intelligence. Irish immigrants brought Staffordshires to the United States in the 1800s. American breeders increased the weight and head size of the animals from the original imported canines. Pit bulls can be any color, with a thick, short and shiny coat. Greyline is a distinct bloodline of pit bulls. Pit bull terriers are a recognized breed both in America and the United Kingdom. The American Kennel Club (AKC) has a set of standards regarding pit bulls. The AKC describes them as stocky, fairly short-legged, muscular animals. Broad skulls, pronounced cheek muscles and widely set dark eyes are the ideal. The back should be fairly short, the neck slightly arched and heavy. While ears can be trimmed back, the tail should never be docked. According to AKC standards, any color is desirable except for more than 80 percent white. A pit bull should be no more than 19 inches at the shoulders, with weight proportionate. As with any breed of canine, pit bulls are subject to selective breeding methods. Inbreeding, or the breeding of closely related animals, has resulted in many undesirable offshoots in the canine world: epilepsy in golden retrievers; a too-long, narrow skull and nose in collies; and other genetic problems in all breeds. Outcross breeding, wherein animals have no common ancestors within five generations, is the safest form of breeding for purebreds. A middle-of-the-road breeding practice is linebreeding. In linebreeding, dogs may share a common great-grandparent, but are no more closely related than that. In the world of dog breeding, certain lines will produce close-to-standards ideal pups that increase the value of these breeding lines. For pit bulls, various lines have become synonymous with outstanding conformance and attitude; the Gottiline, Razors Edge, Nevada, Watchdog and Greyline are examples of these popular breeding lines. 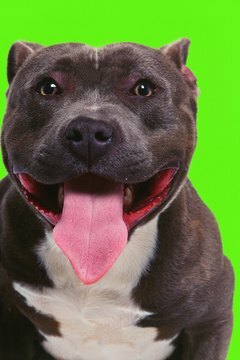 Greyline pit bulls are the result of selectively breeding dogs designated as "bully": exceptionally strong, athletic pit bulls. Greyline pit bulls are bred for working ability, speed and agility. Such animals are often gray and white in color, and have widely spaced front legs, with an almost bowlegged front profile. They benefit from socialization activities from puppyhood on, consistent daily physical activity in the forms of brisk walks and play time. Canine bloodlines come and go in popularity. Breeders promote certain lines in the hope of earning higher sales fees.